When looking back to 2018, some things really stand out to me. Shame is definitely one of them. If you had a year similar to them, let me tell you something: I am jealous. The first time I heard about Shame was when I went to the Windmill in Brixton for the first time. The venue that is actually a home for many South London bands is the perfect place to discover a DIY scene that you have probably never experienced before. 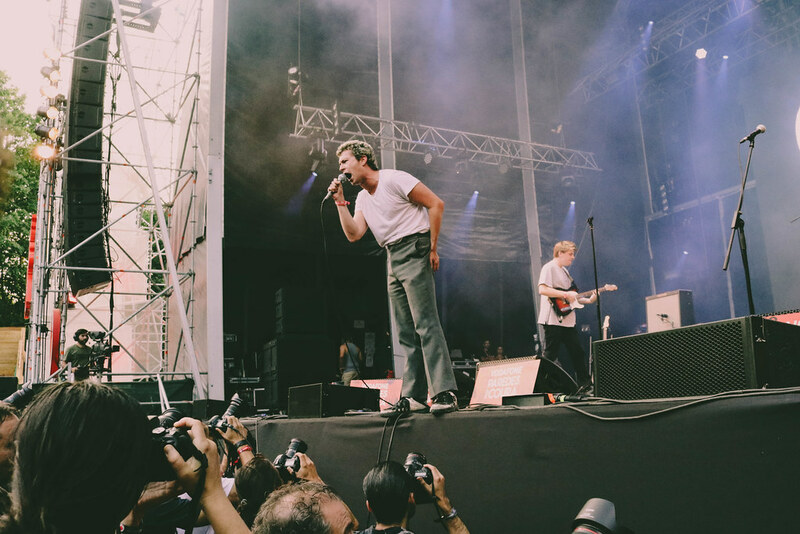 Shame was one of these bands and in 2018 they never, as in… never (!) stopped. If you attended a festival and didn’t cross paths with them, you missed out! Me and my friend Scott attended one of the Fred Perry’s Subculture event at the iconic 100 Club in Soho. This is the place where bands were formed, couples met and encounters with ex’s were avoided (lol). I was mesmerised by all the stories Scott was telling me about the venue until Black Midi got on stage. Our eyes were fixed on the drummer and on the energy of those strangers, who I’m sure I’m going to talk more about pretty soon. Shame were the next act and these are some blurry picture I remembered to take by the end of the show. I have been thinking about writing a blogpost about Shame’s performance since last year. I just didn’t feel like I had enough ‘visual’ content to actually make it work. Even though, the sound wasn’t the greatest, we heard enough to realise Shame was on fire. What is Side Stage without last minute decisions? I was in Porto for work that week, Joana lives in Porto and our friend Fábio was driving from Porto to the festival Vodafone Paredes de Coura every day. It just felt right. Shame were playing on the first big day and I told our friends: ‘Shame are going to show everyone how to do it with no shame. Just watch!’ I was photographing and felt the flame just next to me. The crowd was not ready for such powerful performance but embraced every single second of it. The security guys never seem to be very happy when we finally have a real band on stage, bless their soul. Two weeks later, I found myself at my first proper British festival with Scott (#bffgoals) and the (Sandy) Alex G gang. Early that year, they were on a crazy tour in Australia with a few bands including Shame and they were so excited to see them play at home for the first time. We drove from Manchester that day so I felt slightly spaced out for a few hours but Shame brought me to life. Not entirely, because I was getting severely sunburnt so there are no physical evidences of what I just described. So let me just add that was the most beautiful festival I have ever attended and has the greatest games backstage. Photos & collages by Raquel Candeias.